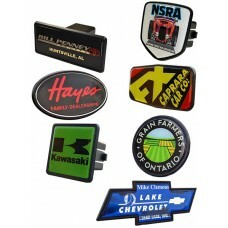 Trailer Hitch Covers are a promotional product that is used to cover the trailer hitch on the back of trucks with your brand name or company logo. The product serves a dual purpose of protecting the trailer hitch of the vehicles, while also promoting your dealership, logo, or brand name. We offer two different types of hitch covers to satisfy any application. The most popular option is the Domed Trailer Hitch Covers, which are screen printed with your imprint and then covered in a dome of polyurethane to protect the imprint against the elements and create an attractive three-dimensional appearance. These come with your choice of a one inch or two inch stem receiver to satisfy the requirements of most trailer hitches. The 3-D Injection Moulded Trailer Hitch Covers offer the advantage of a raised imprint and a lower price point, however require a larger minimum order of 250pcs since a custom mold is required. Before you order hitch covers, it is important to determine the size of the receiver tube on your vehicle's trailer hitch. The most common sizes used on cars sold in the United States are a 2" opening, which is standard, followed by a 1 3/16" opening which is less common. This measurement refers to the width of the opening. 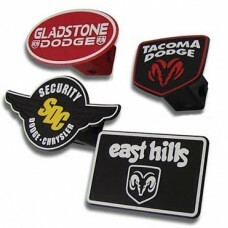 Regardless of which size you choose, our hitch covers will snap into place easily. An exposed trailer hitch is susceptible to deterioration from dirt, debris, and the elements. Over time the trailer hitch can rust and corrode. This can ultimately prevent it from functioning properly for towing. The solution is to cover the hitch, thus protecting it from damage. Our imprinted trailer hitch covers are an excellent promotional tool for owners of vehicles with a trailer hitch since the covers provide a valuable service of protecting the vehicle, while also promoting your brand. Auto dealerships who sell trucks can give these away when they sell a vehicle. Other types of companies who market towards truck owners can also use these as a promotional giveaway including insurance agencies, companies displaying at a truck-related trade show, online truck-enthusiast communities, and much more. The recipient of the hitch cover is likely to leave the cover on the vehicle as protection, while simultaneously serving as a billboard for your brand, organization, company, or message. The custom molded trailer hitch covers are printed with a host stamping process, while the domed hitch covers are printed with screen printing. With both printing techniques, you are limited to the colors of the imprint. It is most economical to go with a one or two-color imprint, which is something you should keep in mind when choosing a design. It is best to use bold contrasting colors with larger readable letters and design elements that will be clearly visible on the back of the truck. Regardless of which type of personalized hitch cover you choose, we require vector artwork, which is usually a file with one of the following extensions: .ai, .eps, or .pdf. If you need assistance or have any questions about your artwork, please reach out to us and we will be happy to help.